Artist Mark Wheatley and writer Robert Tinnell are two good reasons that comic book readers are following the crowds to online media iterations of the 20th century comic panels. 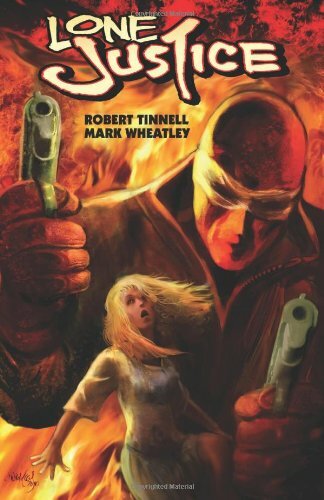 EZ Street by Robert Tionnell and Mark Wheatley. Order your copy today by clicking on the book cover above! Together they produced last year’s Harvey-nominated webcomic EZ Street. Separately, you’ll recognized Wheatley’s work from Hammer of the Gods, Black Hood, Frankenstein Mobster and Mars. And Tinnell is known for comics such as The Black Forest and Feast of the Seven Fishes and film scripts that include Frankenstein and Me, Kids of the Round Table and Believe. He also produced and acted in the film Surf Nazis Must Die. The duo’s latest joint production is the just released, sort-of sequel Lone Justice: Crash! You can read both EZ Street and Lone Justice: Crash! online for free at ComicMix.com. They even have a theme song for their web comics!